Intensive care, sustained moisture retention. 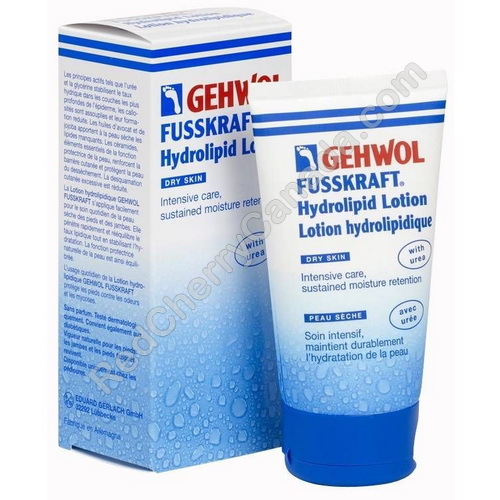 Gehwol Fusskraft Hydrolipid Lotion is an easily distributed lotion for the daily care of dry skin on the feet and legs. It is quickly absorbed and compensates for a lack of lipids and moisture. The natural protective function of the skin is rebalanced. The active ingredients of urea and glycerine bind moisture in the deeper layers of the skin, hard skin becomes smooth and excess new skin formation is reduced. Avocado oil and jojoba oil replenish the lipids missing from dry skin. Ceramides are an important component of the skin's own protective function. They strengthen the barrier layer and protect the skin from drying out. Excessive scaling of the skin is reduced. The daily use of Gehwol Fusskraft Hydrolipid Lotion helps prevent foot odours and fungal infections.